← Friday Afternoon Follies: H.A. Wilson. Physicist . . . or wizard? My day started out not so great–third round with the dentist–but got much better as it went along. I’m actually all a-twitter because this afternoon I came upon not one but two exciting collections that I’d never seen before. The first came about due to my special “reach up on the shelf and pull off a box” technique, but I’m saving this one for later. The second I found by pure happenstance. I was walking through the back room of the archives and heard two of my colleagues discussing a woman named Pender Turnbull. I most definitely recognized the name–a fair number of photographs in our collection have labels that indicate they were donated by her. I didn’t really know anything about her, though, except that she worked for years in the library. I was most surprised to learn that we have a box of her things and when the box was delivered this afternoon I was even more delighted to learn that the box is full of photos. I’ve only had time to look through a couple of envelopes, but I’m already swooning. Here is the entirety of the biographical note that accompanies the collection: “Miss Euphemia Pender Turnbull was born on November 6, 1896, in Rockingham, Nova Scotia, enrolled at Rice Institute in the fall of 1915 and received her Bachelor of Arts degree in 1919. After graduation she accepted a summer job at the Institute and became a permanent member of the library staff that fall, remaining on campus for the next fifty years. Although she never received the title of University Archivist, she was best known in this role.” I have some ideas on where to look for more information, but don’t hold your breath. Staff members around here disappear like melting snow. The image above was in her collection. 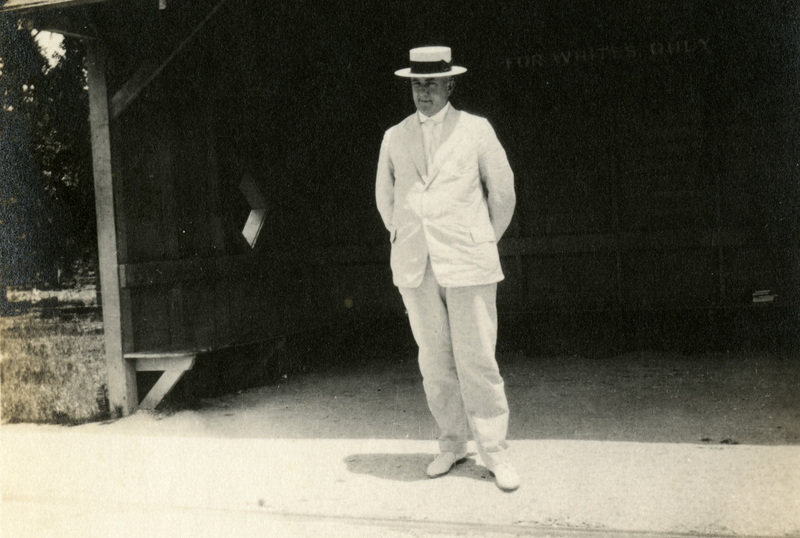 It’s Stockton Axson, Rice’s first English professor, waiting for the trolley on a warm day, probably in late spring. If you zoom in, you can see “For Whites Only” stenciled on the wall behind him. I was surprised by this, but of course I had no right to be. This was what it was back then. 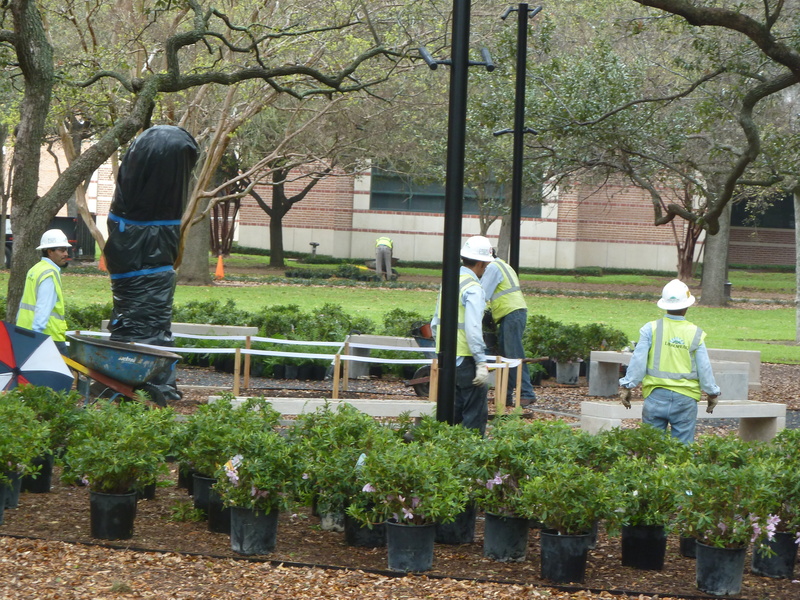 Bonus: So here’s something that happened today–they covered up the owl sculpture by the RMC, then they came and planted a very, very large number of azaleas all around him. He’s going to be very surprised when they remove his blindfold. You don’t have to go back as far as that photo looks like it was to see signs like this. I can still remember “whites” and “coloreds” separate drinking fountains in Hermann Park, and I’m not as old as Dr. Axson! The RMC blueprints (’57?) specified segregated restrooms for Sammy’s, in the basement. What had been the “colored restrooms” became the Pub’s restrooms when it opened. IIRC, it was Marvin Zindler who made public one of the last embarrassing physical remnants of those times, during a Billy Graham crusade in Rice Stadium. What is now the control house for the big scoreboard at the north end of the concourse was once the segregated restrooms, and a sign still hadn’t been painted over on the rafters on the side away from the field. I can’t remember “whites only” signs from my childhood in Houston, but they were commonplace in the small South Carolina town where we spent summer vacations with my cousins in the 1960s: in dentists’ waiting rooms, on public fountains. Some stores were not technically segregated, but my cousins were attuned to signals that let them know either not to go in, or (once they were in) that they had made a mistake and should leave. I still remember my cousin saying, “We’re not supposed to be here” and wondering what in the world she was talking about.